Lentils (Lens culinaris), small lens-shaped seeds, are a member of the legume family. Highly nutritious, they are low in fat and a good source of high-quality protein, being especially rich in lysine and several other essential amino acids. Lentils are also a very rich source of folate which supports nervous system health, aids in metabolism and is necessary for the synthesis of DNA, RNA and red blood cells. Additionally, lentils are a rich source of iron and copper and a good source of the minerals zinc, phosphorus, potassium and magnesium, and the B vitamins pyridoxine, thiamin, pantothenic acid, riboflavin and niacin, which assist in the metabolism of carbohydrates, proteins and fats. Lentils seeds contain phytosterols, phytic acid, saponins and phenolic compounds which have potent antioxidant properties as well as offering cardiovascular support and other health benefits. 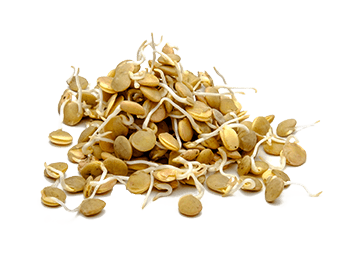 Lentil sprouts have a lightly nutty and fresh pea flavor. Sprouting lentil seeds activates enzymes, improves amino acid and vitamin content, reduces the anti-nutrients that inhibit absorption of important nutrients and improves digestibility.